MIAMI - An Air Force Reserve Unit Hurricane Hunter aircraft investigating the remnants of Tropical Storm Harvey on Sunday found that the system still lacks a well-defined centre of circulation, and so far there is no indication of winds to tropical storm force. However, according to the National Hurricane Center (NHC) in Miami gradual development of this system is possible, and it could become a tropical cyclone once again as it moves west-northwestward across the northwestern Caribbean Sea, near the northern coast of Honduras, during the next day or two. 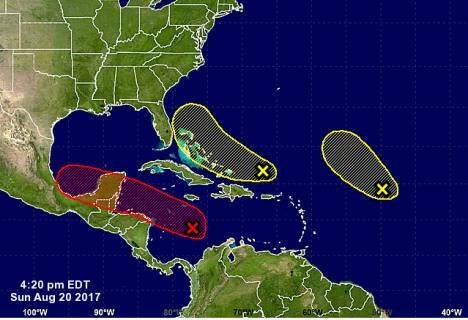 The system is expected to reach Belize or the Yucatan Peninsula on Tuesday. Interests in northern Nicaragua, Honduras, Belize, and the Yucatan Peninsula should monitor the progress of this system. The chance of a tropical cyclone reforming during the next two days is estimated to be medium (50 percent). Meanwhile, satellite data indicate that a trough of low pressure located a couple of hundred miles north of the Dominican Republic is producing disorganized showers and thunderstorms, with some strong winds on its northeast side. Environmental conditions are expected to be unfavourable for development of this system during the next day or two, but they could become slightly more conducive for development by midweek when the system is near the northwestern Bahamas. In addition, a large area of cloudiness and disorganized thunderstorms located about 900 miles east of the northern Leeward Islands is associated with a trough of low pressure. This system is currently embedded in a dry air mass, and upper-level winds are expected to become too strong to support development in a day or so. Therefore, tropical cyclone formation is not likely while this system moves northwestward at about 15 mph.